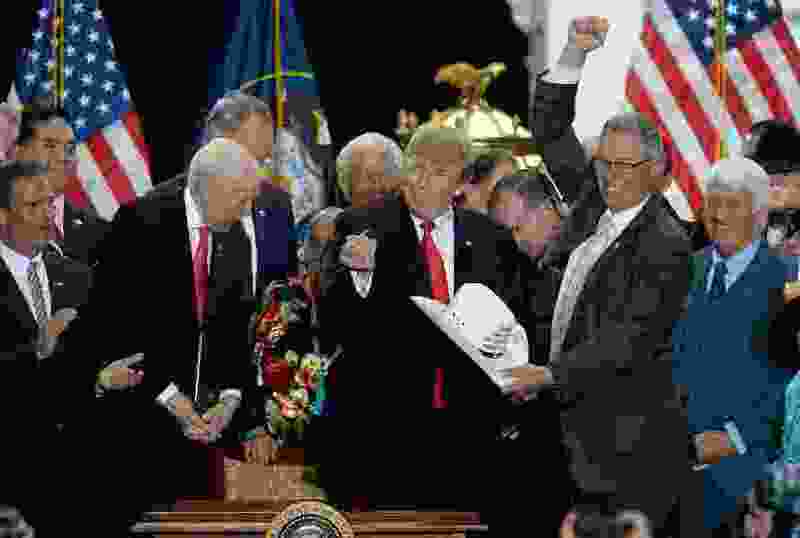 (Francisco Kjolseth | The Salt Lake Tribune) Bruce Adams, right, chairman of the San Juan County Commission, has his hat signed by U.S. President Donald Trump at the Utah Capitol on Monday, Dec. 4, 2017, following Trump's signing of two presidential proclamations to shrink Bears Ears and Grand Staircase-Escalante monuments. A 7th District judge has ordered the Southern Utah Wilderness Alliance to pay San Juan County’s legal costs in defending a recent lawsuit that alleged its County Commission violated state law when it met privately with Interior Secretary Ryan Zinke to lobby for the recision of Bears Ears National Monument. Pursuing his own motion after tossing the suit in April, Judge Lyle Anderson concluded SUWA abused the legal process. The group’s suit was intended to pester the county “with the improper purpose of dissuading commissioners from lobbying federal officials,” wrote Anderson, who retires from the bench at the end of this month. San Juan County has submitted a bill for $3,053.65. SUWA is fighting the sanction, arguing Anderson may have violated a judicial ethics rule barring judges from conducting independent research and fact gathering. SUWA has appealed Anderson’s June 1 dismissal of its suit, along with another issued by 6th District Judge Marvin Bagley rejecting a similar case against Kane and Garfield counties. Anderson’s ruling of court fees is now being cited by a new motion from Kane and Garfield to extract their fees from the environmental group widely reviled by southern Utah politicians. SUWA’s “action is brought to take advantage of rural Utah counties by threatening litigation and seeking attorney fees, knowing that rural counties do not always have the means to oppose such litigation and potentially pay plaintiff’s attorney fees,” wrote the counties’ lawyers. In a June 6 decision, Bagley tossed SUWA’s claim arising from those two counties’ commissioners unnoticed meetings with federal officials to lobby for the reduction of the Grand Staircase-Escalante National Monument. The disputed gathering occurred during Zinke’s May 2017 tour through Utah. The key issue is whether the subject of the commissions’ meetings with Zinke were ones in which the body held “jurisdiction or advisory power,” according to Anderson’s ruling. State law exempts public bodies from holding open meetings to discuss matters over which they hold no authority. Since local governments have no legal say over national monuments, Anderson concluded SUWA’s case was so frivolous, akin to asserting that “apples are oranges,” that no reasonable lawyer would ever argue it. SUWA contends the commissioners’ wielded real influence over the Bears Ears question, a matter of the utmost importance to all Utahns. Zinke’s three private meeting with San Juan commissioners came in stark contrast with those held by his immediate predecessor, Sally Jewell, while she toured the region in 2017 to weighi public sentiment regarding Indian tribes’ proposal for a Bears Ears monument. Jewell met with public officials only in open settings. Although the judge ridiculed SUWA’s arguments as “laughable,” Zinke gave preferential treatment to county commissioners’ concerns during his review of large national monuments. And President Donald Trump invoked the wishes of local leaders when he stripped 2 million acres from the Bears Ears and Grand Staircase monuments in a Dec. 4 ceremony at the Utah Capitol.